Homeowners who simply don't like mowing their own lawn can often find a teenager in the neighborhood to walk a lawn mower back and forth. Teenagers, however, may not be particularly reliable, especially if you're interested in weed-whacking, lawn edging, and careful mowing around flowers, shrubs, and mulch. For dependable and professional service, you're best bet may be to hire an Austin lawn service professional. There are, in fact, many reasons to consider hiring a professional. Lawn service can mean, and often should mean, a lot more than simple mowing. Annual or biannual lawn fertilization, anti-pest and disease treatments, watering services, and other specialized services are all offered through lawn service companies. These services will keep your lawn healthy and looking sharp. Keep in mind that you're getting more than simple convenience from lawn service. Not only will you not need to get out there to spread fertilizer and lawn treatment yourself, a lawn service company will have the equipment and know-how to apply the correct treatment to your lawn in a consistent spread. Once you begin talking to different Austin lawn service companies, you'll probably realize that lawn service can be a lot like ordering from a menu. Some companies will offer more of an a la carte menu, allowing you to choose whichever lawn services you want. Other companies will offer service packages which resemble fast food value meals, where several services are bundled together and you can choose between a few different packages, or pay a hefty surcharge. Companies don't do this to try to get more money out of you. By keeping packages consistent among many different customers, they can streamline their products and their equipment and, typically, offer services at a better rate. Look toward the truism, you get what you paid for when figuring how much your lawn service will cost. Simple weekly mowing may not cost too much more than you'd pay a neighborhood kid. The size of your lawn will also influence the price, but not necessarily to the same extent as a neighborhood kid. You're paying the kid for his time and sweat. You're paying a lawn service for the transportation of commercial lawn equipment as much as anything else. 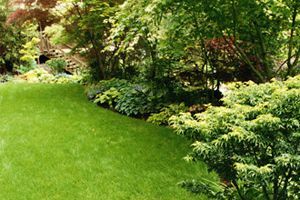 Fertilizing, lawn treatments, and other specialized services will naturally raise the price substantially, as you begin to pay for expertise and lawn treatment products as well as time and transportation. Between the size, services rendered, and frequency, you can pay less than $50 for one-time service, a few hundred dollars for the summer months, or close to a thousand dollars per year for comprehensive services. Unlike other home improvement contractors, you'll most likely be seeing and dealing with your lawn service contractors on a continual basis. This makes it even more important to feel comfortable with the company and the individuals working on your lawn. If you need a contractor to speak either Spanish or English to effectively communicate, be sure to mention this on the phone. Also, it never hurts to offer them a glass of water or lemonade if you're home. Further access to your home, such as using the bathroom, is entirely dependent on what you feel comfortable with. You need not feel compelled, but your hospitality is likely to be rewarded with more detailed lawn service and an easier resolution to any problems that may arise. Comment: Approximately 9K sqFt, healthy w patches w/out growth. Front yard beneath tree is extremely thin. Comment: The backyard is covered in weeds about 2 feet high. My mower crapped out on me when I finished the front yard. Need help! Comment: Lawn in front and back of house needs mowing and edging. Austin Lawn Care Services are rated 4.73 out of 5 based on 3,390 reviews of 80 pros. Not Looking for Lawn & Garden Care Contractors in Austin, TX?